YHA Franz Josef is perfectly located amidst the tranquil green rainforest surroundings of Westland Tai Poutini National Park and World Heritage area, yet only a short stroll to the heart of the village with its cafes, pubs and shopping. Winner 2018 – Certificate of Excellence (Trip Advisor). 2GB Free WiFi for all guests and Free Sauna to relax in after a hard day on the ice. Action and adventure are just around the corner with ice climbing, heli-hiking, kayaking, kiwi tours, glacier exploration, glow worm tracks, eco-tours, ski planes and skydiving all nearby. After a day of exploration chill out and warm up in our free sauna or in front of the cosy fireplace in the large lounge. Great meals can be prepared in the spacious, well equipped kitchen or on the sunny patio area barbecue. Entertainment options include a separate TV lounge with free DVD rentals, book exchange, a variety of games and puzzles and a pool table! Our ultra-clean, bright and modern accommodations range from the economical 10 bed dorm to deluxe ensuite private rooms. Family, twin and single rooms are also available. Flowing almost to sea level into the dense rainforests of Westland National Park, the Franz Josef and Fox Glaciers are some of the most accessible in the world. Spend a day exploring with an experienced guide or take a helicopter flight with breathtaking views of the glaciers. 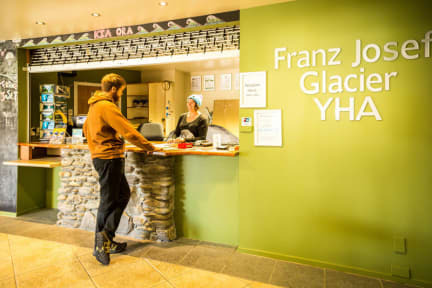 YHA New Zealand is a non-profit membership organisation with a passion for the environment. We are committed to operating in a sustainable manner; this commitment is reflected in our triple bottom line (social, environmental, economic) reporting. All our hostels recycle and limit energy consumption through a number of energy efficiency initiatives. Come stay with us and help make a difference. Guests have 24 hour access to the hostel. Reception is open until 8 PM during the winter, and 9 PM during the summer. If you think you will be later than 9 PM (8 PM winter), please call us for information on late check in. Bookings made on the same day as arrival must be made before 7pm. Hostel fodao! Hehehe quartos grandes, armarios grandes, tem cozinha boa, varios fogoes, net excelente, perto de mercado e restaurante (apesar de q a cidade é um ovo), se vc estiver de carro tem garagem.